Born and trained in Seville, Velázquez moved to Madrid, where he served King Philip IV from 1623. As court painter, his main responsibility was to produce portraits of the royal family and their circle. These remain unsurpassed in their depth of conception and extraordinary painterly technique. Don Pedro de Barberana y Aparregui (1579–1649) was a member of Philip IV’s privy council. He was named honorary postmaster of the realm and, by royal decree, governor of his native town of Briones. Prominently displayed on his doublet and cape is the red cross of the Order of Calatrava, founded in the Middle Ages as a defense against the Moors and subsequently a privilege of the aristocracy. Don Pedro was knighted in 1630, and Velázquez must have painted the portrait soon after he returned from his first trip to Italy in 1631. 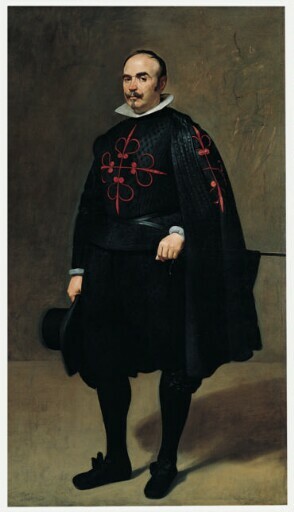 In his full-length portraits Velázquez devised new ways of heightening the illusion of the sitter’s physical presence. Don Pedro commands the entire pictorial space, which is stripped of architectural elements and enlivened by his cast shadow and the soft, ambient light of the background. His left brow raised, Don Pedro looks out with cool, confident aplomb, seeming to scrutinize and appraise the viewer. Much of the force of the portrait derives from the tension between the evocation of a forthright personality and the refinement and elegance of the knight’s costume. Especially noteworthy is Velázquez’s ability to create palpable volumes, particularly in the subtle gradations of blacks in the sitter’s clothing. Painted for Don Pedro de Barberana y Aparregui [1579-1649].